A Vernon grower shares how the 2017 Ambrosia apple season is going. The big question these days is, ‘when are we going to get our local Ambrosia apples?’. We check in with Raj Bagha of RJ Bagha Orchards in Vernon, BC to find out what’s happening in the orchard right now and when we can expect to bite into our first freshly-picked Ambrosia of the season. He reports that he’s got a lot of Ambrosia apples on the trees and they are gaining size, colour and looking really good. In fact, Raj is optimistic that this will be his highest producing year which he attributes to the growing season and the fact that he added quite a few more rows of Ambrosia trees recently. But, it’s not a done deal yet. There’s still at least another month before picking begins and he can rest assured. One thing that Raj is watching carefully is that his trees don’t get too dry. “We’re watering as much as possible. If they don’t get enough water, it can stress them out and then the apples won’t grow in size,” he says. Regular irrigation is key at this stage in the life of the apple but more so this year because of the unusually dry summer that British Columbia experienced. After a late start to the growing season followed by several months of hot and dry conditions, Raj is hoping that the weather becomes more seasonal. “We want 24 – 25°[Celsius] days and cooler nights,” he explains. If this happens for the next month then he expects to see good sized apples with nice bi-coloured (rosy red and creamy yellow) apples that are sweet tasting. The very things that everyone loves so much about Ambrosia. Based on how his Ambrosia orchard is looking right now, he estimates that they will start their Ambrosia harvest around the second week of October. Raj’s orchard is located in the northern part of the Okanagan Valley. Generally, growers in the southern part of the Okanagan Valley and in the Similkameen Valley harvest about two weeks earlier than he does. That’s good news! 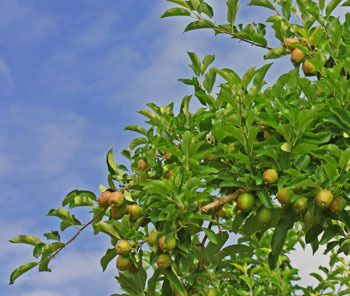 We should start to see locally grown, freshly-picked Ambrosia apples by the end of September. Time to start planning what recipes you’re going to try out when they arrive.